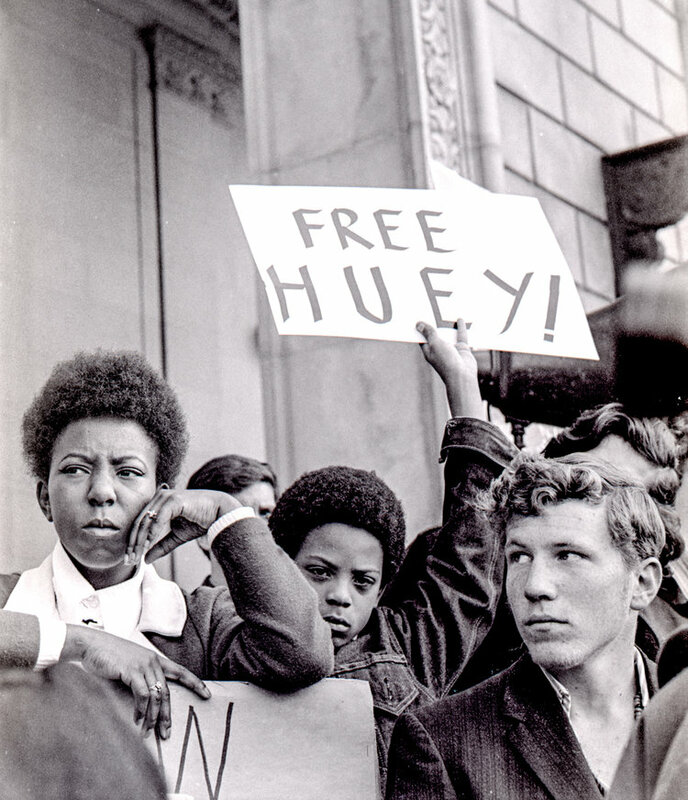 Free Huey rally at Federal Building on 7th near Mission, c. 1969. On the steps of the Federal 9th Circuit Court of Appeals building at 7th near Mission, c. 1969. 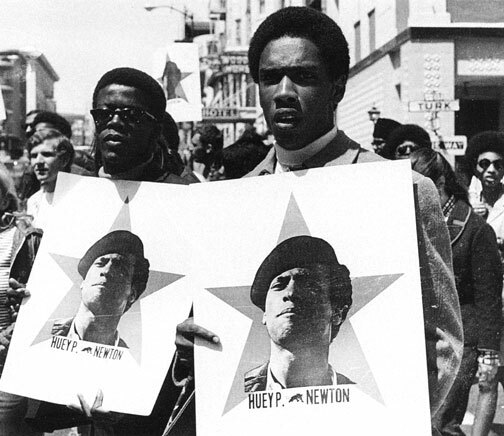 During the summer of 1968 extensive organizing went on to defend Black Panther Party chairman Huey P. Newton, who was facing murder charges in the death of an Oakland policeman during a shootout the previous year. Organizing in the Fillmore, c. 1967. 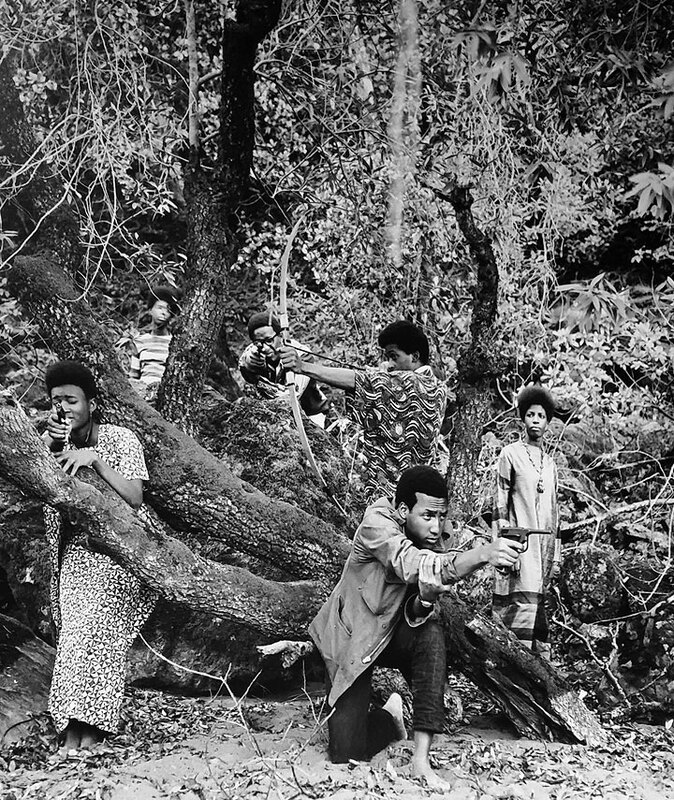 Photos: San Francisco History Center, San Francisco Public Library, from an exhibit January 18-March 12, 2009, coproduced by the African American Center of the SF Public Library in association with the Its About Time Committee: Black Panther Party Legacy and Alumni. 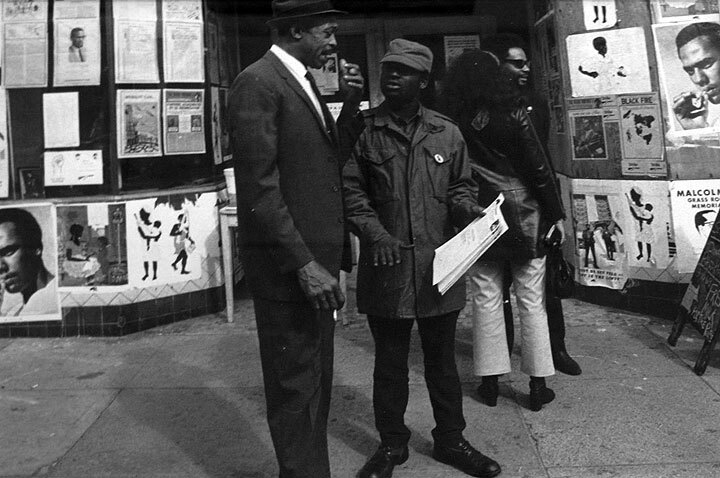 The Black Panthers had a dynamic life in San Francisco. At its height, the San Francisco office had over 200 members. Most were students, workers, nurses, teachers or Vietnam Vets, averaging 18 to 19 years old. Some participants in the Black Student Union at San Francisco State College, who led a lengthy strike in 1968-69 partly on behalf of a fired instructor who was a Panther, went on to participate in Black Panther Party organizing. The San Francisco office worked with local high schools and colleges around issues like Black History being taught in schools. 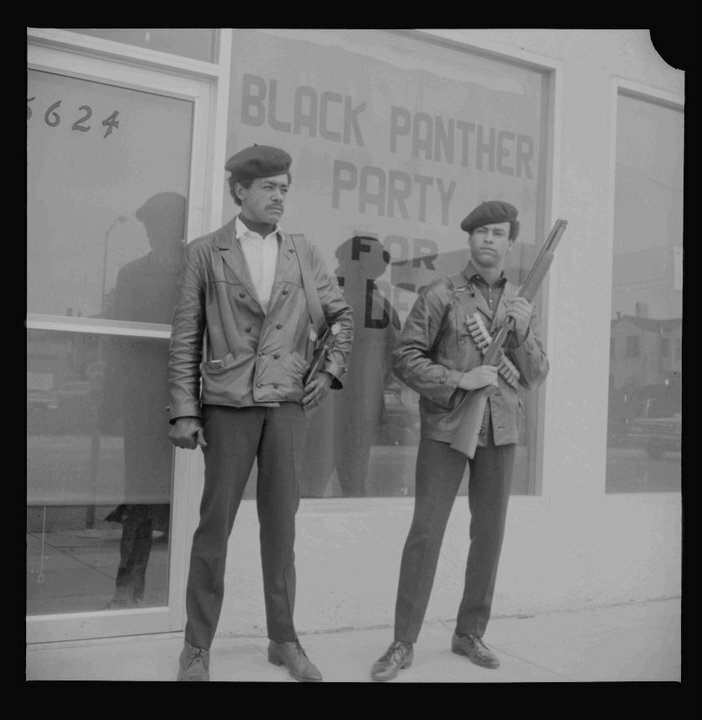 There were Community Centers of the Black Panther Party set up throughout San Francisco in areas like Hunter's Point and in public housing. 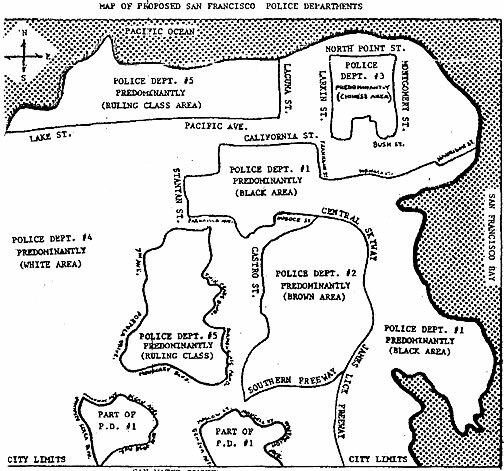 The San Francisco office was the national distribution center for The Black Panther, the Party newspaper. The San Francisco office was also home of the printing press, which printed all the Party materials. Party members also worked with the Brown Berets in the Mission District and the Red Guards in Chinatown to boycott grapes and lettuce in support of the United Farm Workers Union. 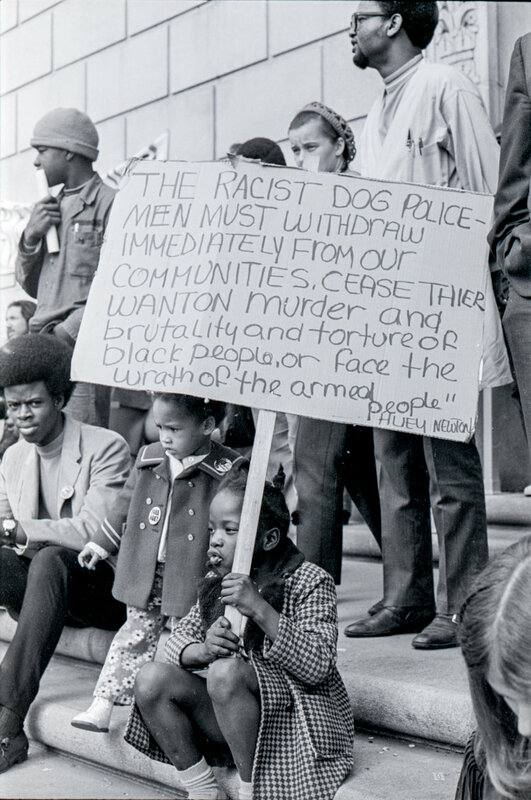 Black Panthers walked the picket lines in front of grocery stores during this effort. 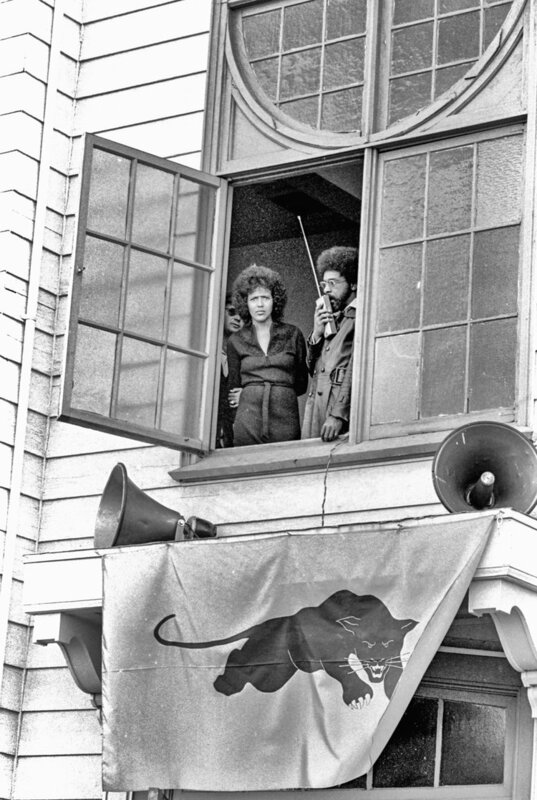 In front of the cluttered storefront they occupy on Fillmore Street, the Black Panthers gathered early today to expressing their rage. "You better stick around, a tall, lanky youth quietly advised. "In a few days there is going to be war." A jury in nearby Oakland had found their leader, Huey P. Newton, guilty of voluntary manslaughter in the death of an Oakland policeman. Unless the decision is reversed, it will mean a prison term for Newton of 2 to 15 years. It was a decision the Panthers could not accept. But not all members of the organization talked of war. "We don't want any emotional outbreak," one of the Panther leaders explained. We don't want anything to break out that will give them [the police] the chance to shoot us down. They are hoping that we will do something like that but we are passing the word to our people to be cool." However, in the streets talk of violence persists. "From this day on the war is on until black people are free, "another of the Panthers on the street said. "This is it and we know it." Even before the jury came up with its verdict the Panthers were preparing to move. In the back room of an apartment deep in the Fillmore slum a bearded youth in an Afro hair style uncovered a stack of rifles that was only partly hidden in a dark corner. He said nothing but began wrapping the weapons in robes and old blankets, preparing to transport them to Oakland, where Newton has been jailed for nearly a year. "The verdict is irrelevant," the youth said. "The sky is the limit." Inside the storefront headquarters early today a tall, husky man who said that his name was D.C. spoke about the verdict. "Our position is that he should have been set free," he began. "It was a racist decision by a racist court." Like most of the Panthers, D.C. wore his hair Afro style. But the beret and the familiar black leather jacket were missing. As tensions here have increased, most of the Panthers have decided not to wear jackets that make clear their identity. D.C. said he thought Newton should be set free. "The brother should be on the streets today,” he said. But he added that he was not surprised by the verdict. "The most I expected," he said, "was a hung jury." 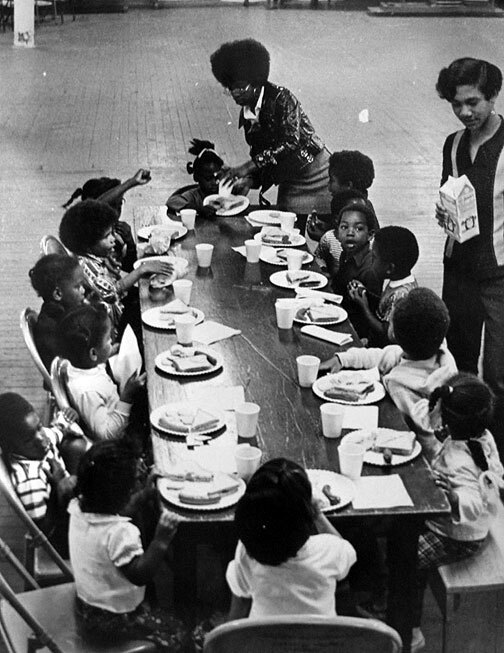 Black Panther breakfast program, started in 1968 in San Francisco. Bobby Seale and Huey Newton of the Black Panther Party for Self Defense in Oakland, California, April 25, 1967. Black Panther publicity shoot, c. 1968. Photo: Kenneth Green Sr., rom Oakland Museum of California exhibit on Black Panthers, January 2017. Original San Francisco Digger Kent Minault has a surprising encounter with Huey Newton in 1966.